Football in Wales always gets quite interesting when we move into the latter stages of the season. Not only is it the time of year when promotion and relegation issues are resolved, but in recent seasons it’s the time when clubs find out whether they’ve been awarded with an appropriate Licence. Licences fall into two categories, you can get a UEFA Licence combined with a FAW Tier 1 Licence, and that in effect allows you to not only compete in the Welsh Premier League, but also in either the Champions League or the Europa League. You can also be awarded just a FAW Tier 1 Licence, and as you can imagine, that entitles you to play in the WPL, but, of all of the applicants for the said Domestic Licence next season, three of them withdrew their application, namely Prestatyn Town, Porthmadog and Penybont. 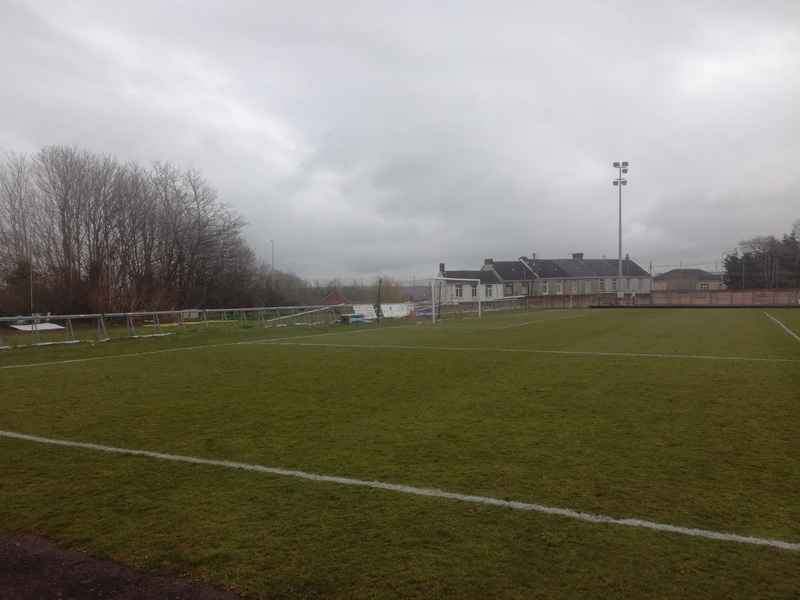 While a further three were declined, namely Bangor City, Connahs Quay Nomads and indeed Llanelli Town. I found this information out the night before I was due to pay a visit to see Llanelli Town. 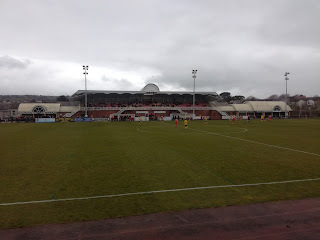 My plan was to keep an eye out as to who looked favourites for promotion out of the Welsh Football League in the South, and when it looked a reasonable shout that barring a disaster it was going to be Llanelli, I made my mind up to go and watch the last home game of the season against struggling Monmouth Town. While the exact reasoning for Llanelli’s failed application had yet to be revealed, the club were appealing the decision and remained confident it would be successful. In recent seasons I’ve seen this happen on a few occasions, and in virtually all cases I’ve seen the decision overturned. Quite often it is something administrative or indeed bureaucratic that causes they issue, as opposed to something fundamentally wrong with the club or its practices, but more on that later. 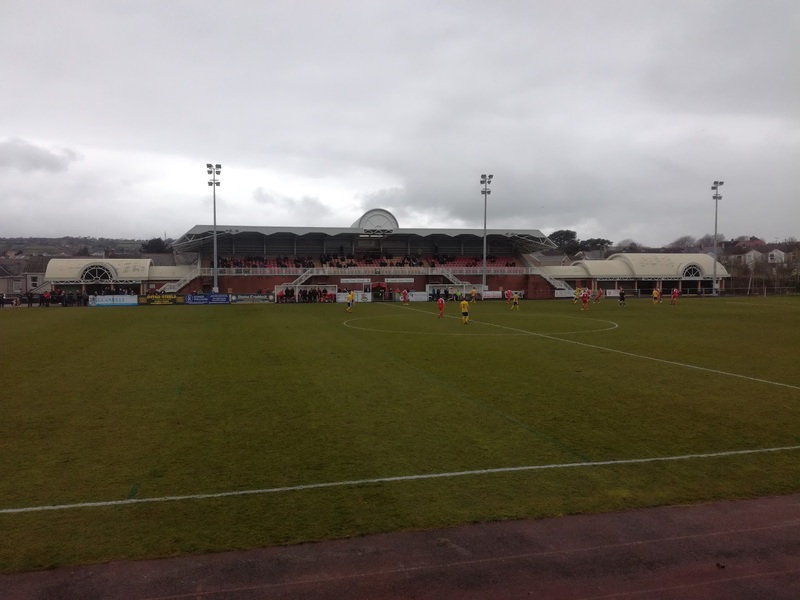 Llanelli, while very much a Rugby Union town with the famous Llanelli Scarlets playing out of the magnificent Parc Y Scarlets, and prior to that Stradey Park, has got a rich football history. In the period from the Thirties to the early Fifties, Llanelli AFC made numerous applications to join the Football League without success, but the real halcyon days of the club came in the period from 2005 to 2011 when thanks to heavy investment they were League Champions, Welsh Cup Winners and also played in Europe for seven successive seasons. Games were won in Europe against Gefle, KF Vetra, FK Ventspils, Motherwell and Dinamo Tbilisi, however only once did they win a round on aggregate. 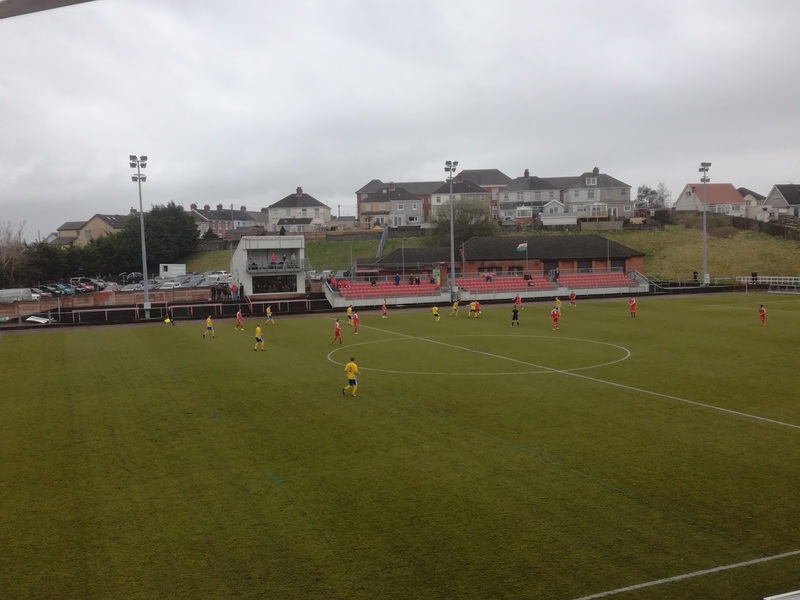 The club as they were known were wound up in the High Court in April 2013, but a new club was formed and started the 2013-14 season as Llanelli Town, still playing at Steboneath Park, albeit in the fourth tier of the Welsh Pyramid. Five seasons later and they are on course to win their third promotion and return to the level once held by their predecessors. 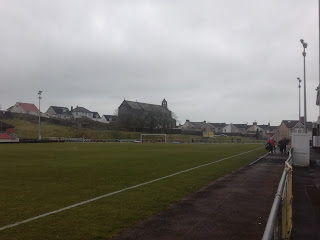 It’s a great story, and one not that dissimilar to the one at Barry Town United that I covered last season, so it was time to go and have a look. Three and a half hours after leaving home I was pulling into the car park at Stebo, a ground located just East of the town centre and not far from Parc Y Scarlets which was hosting the Scarlets v Glasgow game later that day, albeit due to the staggered kick off times, traffic both before and after wasn’t going to cause me an issue. The ground is a big complex. At the end of the car park is the very smart clubhouse and function room facility, which sits adjacent to the turnstiles which bring you into the stadium right opposite the iconic structure that is the main stand. On the turnstile side is the TV Gantry and Corporate Viewing Area, while next to this is a bank of uncovered seating, opposite as I’ve said is the 700 seater main stand which offers a fantastic elevated view. The dressing rooms are underneath, while the refreshment facilities are to one side, with a further bar area to the opposite side. Formerly an athletics stadium, the running track is long gone, but the oval shape is still in existence so it’s not viable to view that game from either end of the ground, albeit I guess if you really wanted to you could. Developed in the late Seventies / early Eighties, it still has that charm and style to it that’s synonymous with the era in question. Capacity wise it’s more than big enough based on the crowds Llanelli get, but as for Europe, they have had to play games elsewhere, namely the rugby stadiums or indeed Swansea’s Liberty Stadium. Playing upfront for Llanelli is Lee Trundle. He may be 41 now, but the Swansea City Legend turns out for Llanelli when his commitments as a Club Ambassador and Junior Coach at the Liberty allow. Last season he scored nine hat-tricks in all competitions for the club, while today against Monmouth he scored one, created one and was simply a joy to watch with his first touch and vision. 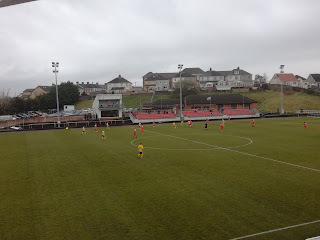 In front of a crowd of 248, Llanelli took the lead through Trundle who’s shot from the edge of the box was too hot for the visiting goalkeeper to handle .However just before half time the visitors equalised, and deservedly so based on the way the game had developed, through Lewis Clare who bundled the ball home following a corner. The second half was very much about Llanelli. Jordan Follows curled a lovely shot from twenty yards into the back of the net, and the with ten to go Trundle set up Kurtis March to score from close range to make it 3-1. As the game moved into injury time, some neat play found James Loveridge and he despatched a well struck shot into the corner of the net, leaving the final score 4-1. The result effectively means Llanelli need three wins from five games, and that assumes Haverfordwest County win all seven of their remaining games. I would say they have one hand on the prize, but no one will be celebrating just yet. So, that Licence issue. It was commented on in the programme and it appears it’s something to do with the Clubs Auditors and work they have done / not done on behalf of the club. No more detail was forthcoming but you sense the club are confident all will be ok.
Llanelli Town will be a fantastic addition to the Welsh Premier League, and following the troubles over recent years of the likes of Llanelli AFC, Barry Town, Neath and Port Talbot Town, it is great to see a big name returning to its rightful place.